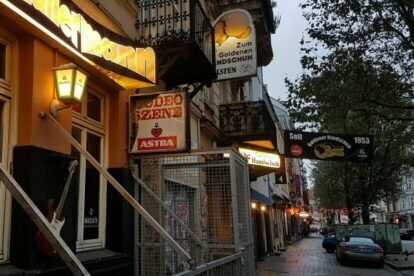 Everyone who has visited Hamburg knows the Große Freiheit – neon lights, bouncers and tourists everywhere… But: there is a street, not far from Große Freiheit, where the Hamburg locals party on the weekends: the Hamburger Berg. Many smaller clubs and bars can be found on that street, one next to the other. What I like best about Hamburger Berg is that you don’t have to pay to get into the different locations! When my friends and I go out on a Friday or Saturday night, we always end up at Hamburger Berg. We start with one club, and if we don’t like the music or the place is too crowded, we just go next door and check out the next bar. On Hamburger Berg, you can just go with the flow and change locations whenever you like. Many of the bars on Hamburger Berg offer monthly events, like the foosball tournament at Ex-Sparr. It will definitely not get boring on Hamburger Berg!